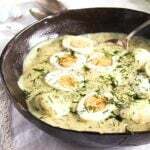 A quick and easy recipe for traditional German Eggs in Mustard sauce – leftover hard boiled eggs in a creamy mustard sauce with dill. This is a repost from April 2015. What to do with all the leftover eggs from Easter? I always have a lot! A LOT! For instance, once I had 5 kids in the kitchen dyeing eggs shortly before Easter, they had a lot of fun and in the end we had 30 eggs in 5 different colors, painted with glitter pens and plastered with chicken and bunny stickers. Next day we got another 10 as a present and on Easter Sunday the Easter Bunny left another 10 hidden in grandmother’s garden. So what to do with so many eggs? One can only eat so many for breakfast. What to do with leftover hard boiled eggs? 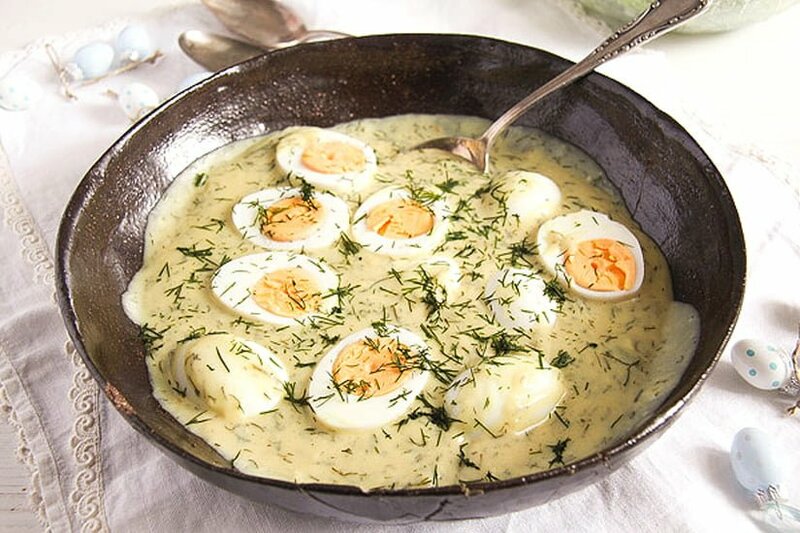 It is a typical German recipe, at least I’ve never eaten anything like this in Romania, but here you get it quite often around Easter or in spring anyway. 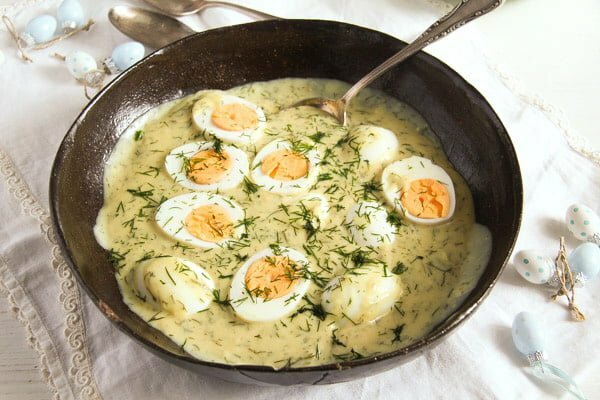 The Hard Boiled Eggs in Mustard Sauce are easy and quick to make (not to mention cheap), especially if your eggs are already cooked. 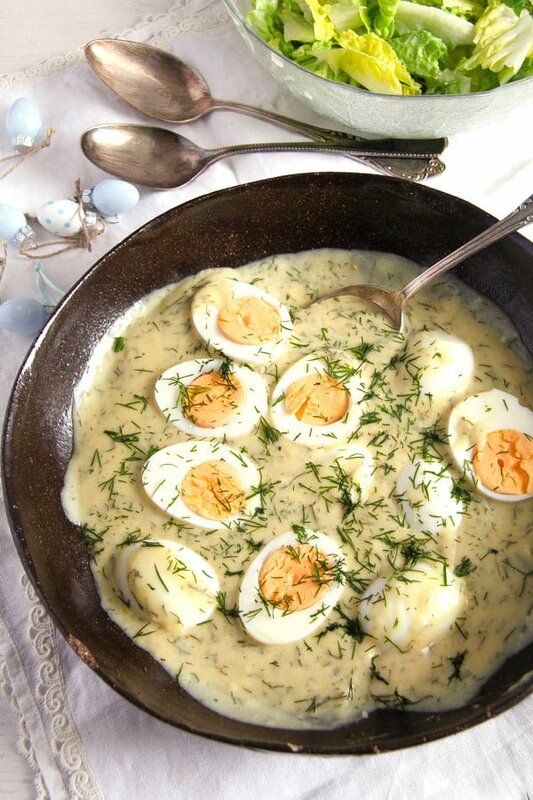 Hard boiled eggs in a velvety mustardy sauce, a lot of dill and potatoes on the side. I made a huge pot using 16 eggs because we also had some relatives coming over and it was all gone. How to make the mustard sauce? When it comes to mustard sauce, it is all about the mustard! 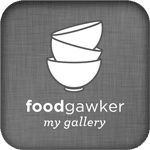 The sauce is very easy to make, any beginner in cooking can make it in a flash, but the sauce will only taste good, if you use good quality mustard. Mustard is generally not that expensive, even with a smaller budget you can still get a good quality mustard. However, do not buy the cheapest one you can get and when you buy it make sure there is no weird stuff on the ingredient list, words you cannot even understand. Most of the times I use a German medium mustard when I make this mustard sauce for eggs. It is hot, but not disturbingly so, I think about the kids when making the sauce. I like a hot mustard sauce as well, but my children don’t, so I mostly stick to the medium sorts of mustard. I like to use the German Born Senf or the Dijon mustard from Maille, which is not German, but which I love. And by the way, this is not a sponsored post, I just like those two kinds of mustard and I actually only use them when making Hard Boiled Eggs in Mustard Sauce. Sometimes I mix medium and hot mustard for a bit more kick, but that is only when the children are eating somewhere else. Do try both kinds of mustard sauce, either medium or hot, see what you like best. This is a dish I make every year shortly after Easter, it is such a wonderful dish when it comes to using all those leftover hard boiled eggs. However, if you want to make it from scratch or at any other time of the year, please do. Cook your eggs, about 1 ½ or 2 per person and make the sauce while the eggs are getting cool enough to handle. Dill is mandatory, if you ask me, and it definitely has to be fresh or frozen, do not use dried dill in this case, it will not be good. However, if you do not like dill at all, you could replace it with fresh/frozen chives or parsley. I still think dill is the best choice for mustard sauce, but chives or parsley are acceptable too. Adjust the taste of the mustard sauce with lemon juice and a little sugar. Start with the indicated quantities and add more of both to taste. 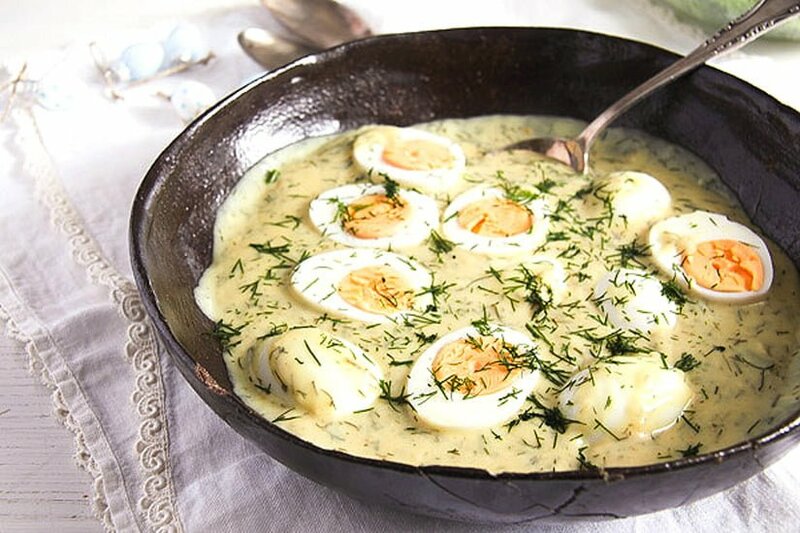 This dish is made to be served with boiled potatoes, I cannot even imagine eating the Hard Boiled Eggs in Mustard Sauce with any other side dish. The easiest method I know, which is also energy saving, is to give the eggs to a saucepan, cover them with water and bring to a boil. As soon as the water boils, remove the pot from the heat and let the eggs in the covered saucepan for 12 minutes. Give the eggs to a colander and rinse with very cold water to stop the cooking process. Leave for a few minutes, until cool enough to handle, before you peel them. Place the eggs in a large saucepan and cover them with water. Bring the water to a boil, then remove the saucepan from the heat. Leave to stand, covered for 12 minutes. Give the eggs to a colander and rinse with cold water to stop the cooking process. Let the eggs cool down for a few minutes, then peel and halve them. Melt the butter in a saucepan large enough to hold all the eggs in the end. Sprinkle the flour in the saucepan and stir well for about 1 -2 minutes until the flour becomes a bit yellow, but doesn't get too dark. Start adding the vegetable broth, little by little, whisking constantly to avoid your sauce getting clumpy. In the end the mixture should be very smooth. Add the heavy cream, bring to a boil and cook, stirring very often, until the sauce thickens and coats the back of a wooden spoon. That should take about 5 to 8 minutes. Add the mustard, lemon juice, sugar and dill and stir well. Adjust the taste with salt, white pepper and more lemon juice or sugar if necessary. Place the eggs halves in the saucepan, stir very gently to cover with sauce and heat through for a few minutes. 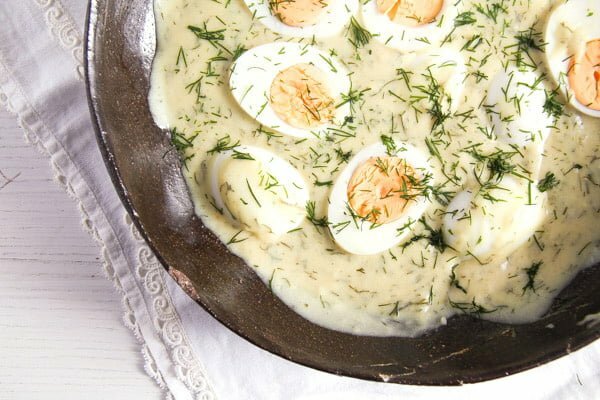 Serve immediately with boiled potatoes and green salad. You’re welcome, Helena. I am glad you like this. This is different. 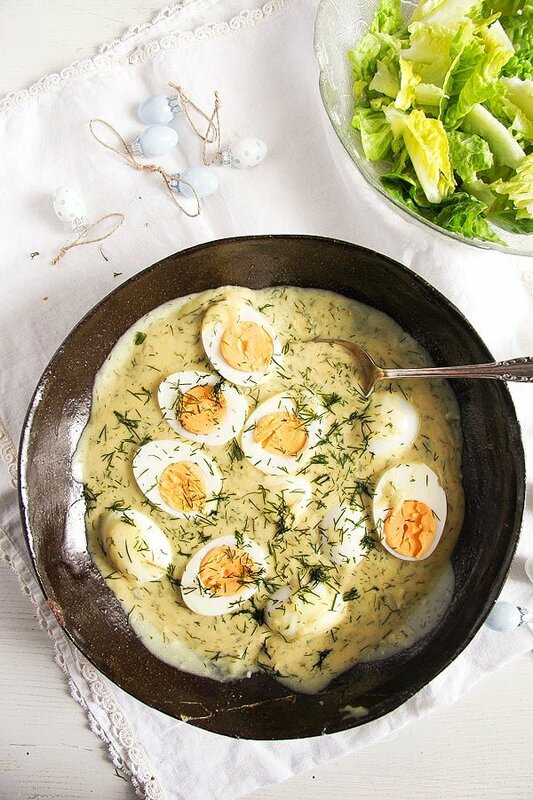 Love the idea of making a meal out of boiled eggs. Once again, an amazing sauce. Just picked up 2 dozen fresh eggs from a friend and this is a perfect dish for them. Thanks Adina! Wow! It sounds and look wonderful! I must make it for my husband! We will both love it (who doesn’t love mustard and eggs???). I am always looking for new ways to prepare eggs. This is awesome and kind of has the flavors of egg salad, which is cool. Love your recipe and can’t wait to give it a try. Mustard is one of my favorite condiments. This looks amazing! It had me at the eggs. My grandfather used to make this dish when I was little and I loved it. I am now a great-grandmother and so thrilled to have the recipe. Thank you!